This week is Banned Books Week, and once again we are surprised and dismayed to see the lists of books that have been challenged and banned. We’d love to stop celebrating Banned Books Week – if only there were no more banned books! 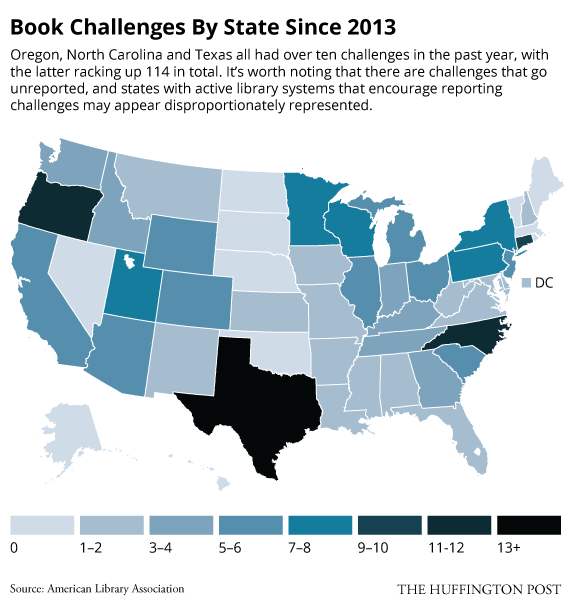 The Huffington Post put together a great group of infographics in Banned Books by the Numbers, including “by state” as seen below. In honor of the “celebration,” I’m re-reading Fat Kid Rules the World, by our friend and client, K.L. Going.